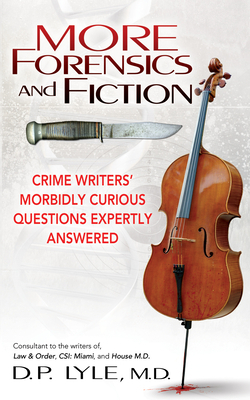 This compilation of medical and forensic science questions from crime writers around the world provides insight into medical and forensic science as well as a glimpse into the writer's creative mind. How do hallucinogenic drugs affect a blind person? Will snake venom injected into fruit cause death? How would you perform CPR in a helicopter? What happens when someone swallows razor blades? How long does it take blood to dry? Can DNA be obtained from a half-eaten bagel? D. P. Lyle, MD, answers these and many more intriguing questions. The book is a useful and entertaining resource for writers and screenwriters, helping them find the information they need to frame a situation and write a convincing description. TV viewers, readers who enjoy crime fiction, and those who want to know more about forensic science can keep up with the news and understand the science behind criminal investigation. From traumatic injuries to the coroner's office, the questions and answers are divided into five parts, making it a compendium of the incredible information that lies within the world of medicine and forensics. D. P. Lyle, MD, is the Macavity Award-winning and Edgar(R) Award-nominated author of the nonfiction books "Forensics for Dummies," "Forensics and Fiction," "Howdunit Forensics," and "Murder and Mayhem," as well as the thrillers "Devil's Playground," "Double Blind," "Royal Pains: First, Do No Harm," and "Stress Fracture." His essay on Jules Verne's "The Mysterious Island" appears in "Thrillers: One Hundred Must-Reads." He practices cardiology, teaches online forensic science classes in the master of arts in criminal justice program at DeSales University, and has worked with the writers of such popular television shows as "Cold Case," "CSI: Miami," "The Glades," "House," and "Law & Order." He lives in Lake Forest, California.